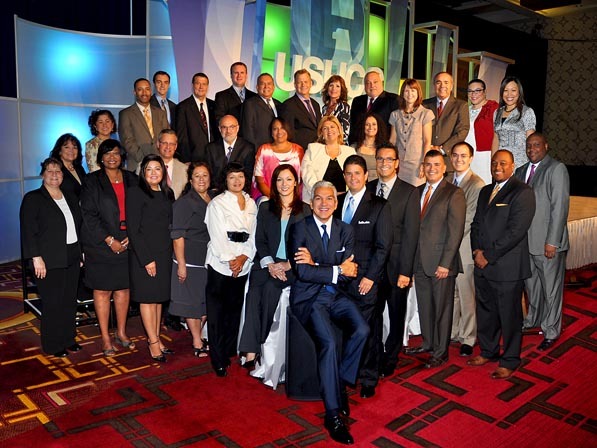 Members of the United States Chamber of Commerce's Million Dollar Club join USHCC president and CEO Javier Palomarez (center). When the United States Hispanic Chamber of Commerce (USHCC) launched its Million Dollar Club in 2009, there was no way the organization could have anticipated how successful some companies would be at championing supplier diversity. The Million Dollar Club was introduced as a way of honoring corporations and procurement executives who demonstrate support for Hispanic Business Enterprises (HBEs) through spending with Hispanic suppliers. Ford went above and beyond “demonstrating support.” The 109-year-old company has successfully integrated supplier diversity into the way it does business with its 35-year-old Supplier Diversity Development (SDD) program. Since 1978 Ford has spent more than $67 billion with minority suppliers and, in 2012 alone, the company spent $5.7 billion with tier-one minority-owned suppliers, $1.2 billion with tier-one women-owned suppliers, and its tier one suppliers spent $2.1 billion with tier-two diverse businesses. Last year was a great year for Ford with the National Minority Supplier Development Council naming Ford as Corporation of the Year for the fourth time. Ford was also just one of three companies designated by USHCC’s Million Dollar Club to have spent at least $500 million on supplier diversity. For two years now, Carla T. Preston has been at the helm of Ford’s award-winning program as its director. Preston, a former engineering manager, learned about the company’s supplier-diversity program while working in product development. Despite Ford’s impressive numbers over the last two years, Preston remains humble, saying she stepped into an “incredibly strong, well-established program.” Preston takes a great amount of pride in Ford’s Aligned Business Framework (ABF), a series of agreements with select suppliers to strengthen collaboration and develop sustainable business models to drive mutual profitability and technological development. Ford currently has 79 production suppliers and 25 nonproduction ABF suppliers, with 14 of those being minority and women suppliers. Ford, which is a long-time supporter of the USHCC, intends on making veterans a key focus of its SSD program moving forward. The company has committed to spending 3 percent of its US purchasing budget with qualified veteran-owned businesses and asked its tier-one suppliers to also source to veterans. Preston, who was appointed as Chair of the USHCC’s Procurement Council Advisory Board in February 2013, finds her work personally meaningful. She is a Latina working in a male-dominated field and her position enables her to help other women and minorities take their businesses to the next level. She says she’s proud to be working for a company that has always recognized the importance of the USHCC, as evidenced by Ford being a founding sponsor of the USHCC’s Foundation BizFest, an innovative and intensive entrepreneurship program that empowers Latino youth with knowledge and insight into the business world.